Irish Sailing works tirelessly to promote sailing in Ireland and abroad and has been successful in securing funding of 1 million euro from Sport Ireland. However, to compete on a par with other nations, a further €2 million is required annually to realise the ambitions of our talented sailors. For this reason, the Irish Sailing Foundation was formed to seek philanthropic donations. Led by a Board of Directors and Head of Development Kathryn Grace , the Foundation is successfully leading a campaign to bridge the financial gap to provide the Performance Pathway with the funds necessary to increase coaching hours, upgrade equipment and provide world class sport science support to a greater number of high-potential Irish sailors. In order to maintain the highest levels of accountability and transparency, the Olympic Steering Group govern how all funding generated by the work of the Foundation is spent to the benefit of the Performance Pathway. The Performance Pathway has a proven track record of success and is made up of Junior, Youth, Academy, Development and Olympic squads and it provides young, talented and ambitious Irish sailors with the opportunity to move up through the ranks from an early age. In order to ensure we keep the young talent progressing we must secure the financial assistance they need to remain in the game. 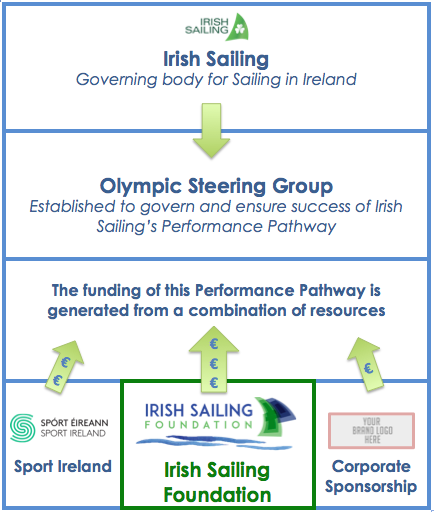 While Sport Ireland has generously supported the Performance Pathway, the transition to the senior ranks exposes additional financial constraints which the Irish Sailing Foundation and a Corporate Sponsor (for the team, sails & the newly launched Performance HQ) will help to ease. With the help of our visionary Support Network at home and abroad, we are generating the resources required by young sailors launching from their local pier onto an Olympic podium.